aJ H0m bOHut KhushEi: i'm back..
it's been awhile since my last entry. busy with my FYP etc. 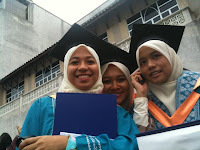 but now, i'm already a biotechnology graduate.. woot! woot! ok..well, guess my status now is, still a student -.-"
owh btw, though i love to watch Japanese drama, never i've ever imagined that i'l be working under a Japanese. its great working with people that has wide knowledge in his field.. need to learn so much thing from him. working style, the subject itself, japanese language, etc..
ja... lets enjoy the stress. lets work harder. lets strive for the best! Hukum menyentuh isteri apabila berwudhu?